Alright, so you’ve heard us preach that layering sales incentives on top of sales contests isn’t mandatory for motivation. It’s true. And here’s some surprising news: One of those was low cost. You’re on it if you guessed #2. The sales reps that received the incentive actually sold tickets for the sports team involved. For those of you without big budgets for fancy prizes that brings us to one piece of…shall we call it homework? Walk away from this post considering this question: Does our company have access to any unique experiences that could act as exciting sales incentives? If you come up with something and use it, be sure to let us know. Then we can add to the list for when we go Round 2 on this topic. 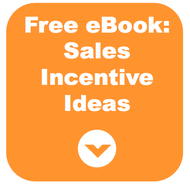 Check out these 5 killer sales incentives from last year and walk away with a tip for finding your own killer sales incentives this year.